Spicewood customers can automatically receive the famous KIWI Lover One–Year Carpet Cleaning Service if they spend $120 or more on their initial carpet cleaning. 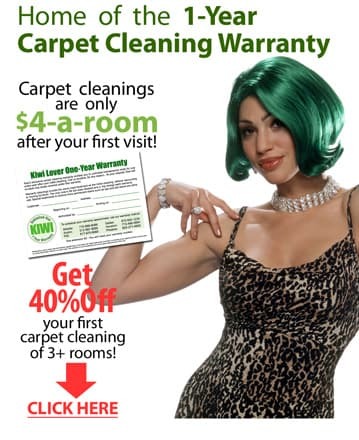 The warranty gives those customers a full year of warranty carpet cleanings for just $4 per room, plus a $37 trip charge. We’ll be there for you through every mess, every stain, and every spill for a whole year. that’s our promise. We promise that all of our services will always be free of harsh chemicals and safe for your home and the environment. KIWI continually achieves these goals by only adding all-natural ingredients to our carpet cleaning solution, so that it’s 100 % safe for kids, pets, and the whole family. We also only use the dry carpet cleaning method because it creates no wastewater and dries in as little as 15 minutes, never leaving you with soggy carpets. For more information about carpet cleaning in Spicewood, or to schedule a service, call the Austin area KIWI Services Center today!